Long ago, Lay's potato chips bet America that they couldn't eat just one, and America did not disappoint, eating so many chips that America's doctors were like, "Maybe have an apple every once in a while and stay the hell away from me". And now they went and put chocolate on them. The choco-chips are currently available for a limited time, and only at Target stores. Of course. Like Missoni. For a snack food, they're not cheap: it's $3.49 for a 5oz bag. Are they worth the price? Let's find out. Who Thought This Was A Good Idea? Someone who starred in Heavyweights, presumably. Probably Goldberg. 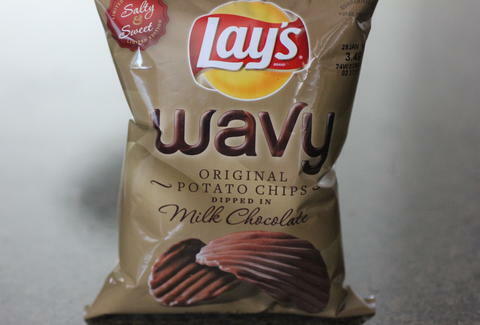 Tasting Notes: Normally potato chips are loaded with all kinds of additives (including MSG), but the ingredients are refreshingly simple: chocolate, potatoes, vegetable oil, and salt. And it makes sense that chocolate is the first ingredient, as there are strong Hershey bar-like notes up top, with weaker salt and potato flavors at the back end. 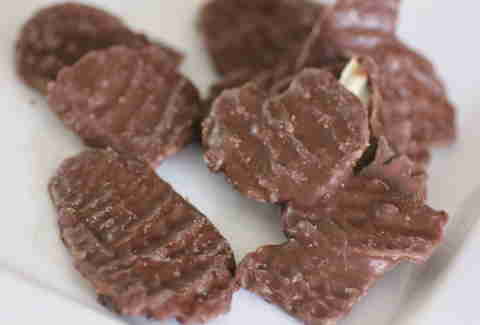 The chocolate is super rich and sugary, and manages to overpower the chip flavors. At first I was bummed that they came in such a small-looking bag, but these are deceptively heavy. Eating a few makes you feel like you've eaten an entire candy bar. And once you've had a chip or two, you're left with a funky salt aftertaste that'll have you running to the fridge for water. Or an Aquafina, if you're feeling brand loyal to Frito-Lay/Pepsi. Are They Worth It? You're better off buying a high-quality $2.50 chocolate bar and a 99 cent bag of chips, cramming them both in your mouth at the same time, and then performing the Heimlich maneuver on yourself. In summation, these do not merit the trip to Target. Just eat normal Lay's chips that are delicious.